Irene Bobs loves fast driving. Her husband is the best car salesman in southeastern Australia. Together they enter the 1954 Redex Trial, a weeks-long endurance contest of a car race that circles the entire continent. With them is their lanky, fair-haired navigator: deposed quiz show champion and failed schoolteacher Willie Bachhuber. If they win the Redex, the Bobs name alone will get them a dealership, and Willie will have recharged a life currently ground to a halt. But before any of that might happen, their official strip maps will lead them, without warning, out of the comfortable white Australia they know so well. 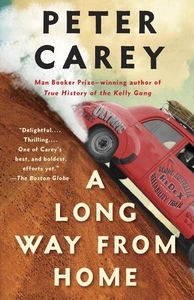 A breakneck, often hilarious, eye-opening adventure that at the same time reminds us how white people took possession of a timeless culture--the high purpose they invented, and the crimes they committed along the way--A Long Way from Home is Peter Carey's late-style masterpiece.